October 11, 2018 | -by: Kevin George. Halloween is about attending Halloween costume parties, carving pumpkins, trick-or-treating, and playing pranks and divination games. In the eyes of a marketer, this the beginning of one of the biggest shopping times of the year. This time is a great opportunity for email marketers to engage with their customers and draw maximum profits out of their business. It is anticipated that as shoppers hunt for costumes and embellish this Halloween, they are more likely to shop at Discount and Halloween stores. Email marketers can take up this opportunity to garner the shoppers’ attention and convert the prospects into customers by sending the right email to the right person at the right time. While this year, trends like interactivity in emails and use of machine learning are expected to make the rounds, Monks share email examples from brands who hit the right note with their Halloween email campaigns. Subject line: Don’t let Halloween sneak up on you. ModCloth sets a perfect example of how you can make your email stand out this Halloween. The ample whitespace helps the email breathe. They have created an innovative heading ‘Witch, Please’ with an attractive GIF at the top. The images and copy are in sync with the Halloween mood. They have followed the email best practices and linked their social media accounts along with an unsubscribe link. Click on the email to experience interactivity. The email uses kinetic effects that display the animation effects after the reader clicks on a button and interacts with the email. The visuals are enticing enough to prompt the subscriber to take the next action. The Halloween offer is highlighted towards the end with a clear CTA that is sure to get clicked. Subject line: Little bash of horrors tickets on sale now. Bit Bash, a Chicago based gaming community has combined the best of email design features in order to impress their recipients during Halloween. They have used spooky headings with bold and centrally placed CTAs. The best thing that makes this email unique from the rest is that it has an update subscription preferences link along with the Unsubscribe link. The subject line of this email creates a sense of urgency and the email contains a countdown timer that prompts the viewers to click further. The design is simple and the colors used to give the feel of Halloween. The CTAs are highlighted along with product images. Subject Line: Our HALLOWEEN SALE starts now! 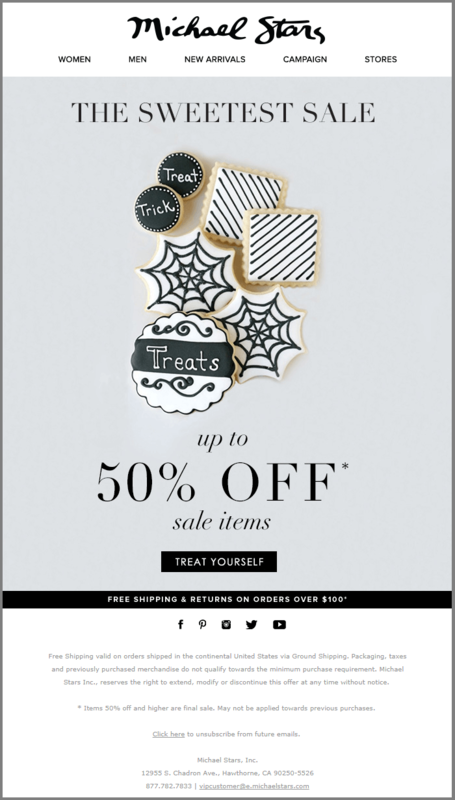 A simple Halloween email template with minimalistic design marks the beginning of their Halloween sale. The offer and CTA are highlighted over a light background and the color schemes used are different from the usual orange and black color theme. This email from BlueFly is an excellent example for product showcasing. Highlighting the Halloween offer and the CTA right above the fold followed by multiple offers, the email provides all major information right in the email. The holiday season demands emails that stand out in the subscribers’ inbox. RayBan promotes its range of shades for Halloween with the use of bright colors and GIF animation. The offer also includes a complimentary gift which is depicted in the image. This is a Halloween sale email that uses images and color themes that go well with this specific day. With an overall clean layout and just two sections with appropriate CTAs, this email has a really good approach. Do you wish to give your Halloween emails a similar look and feel? Get in touch with EmailMonks, who can design and code a template for you. Happy Halloween! Great list of inspiration! Thank you for sharing! Thank you very much. Glad that you liked. Stay Connected. 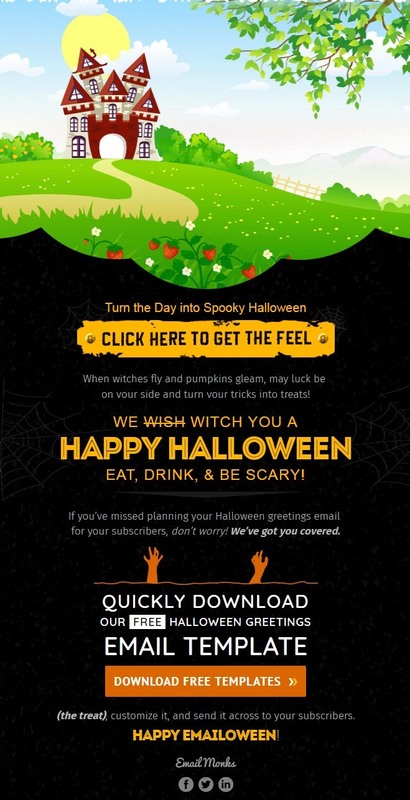 Planning to send Spooky Halloween Email Templates? EmailMonks can help you create one.